Bosch dishwashers are designed with economy in mind. They can help reduce the time you spend in the kitchen and deliver a quality wash while saving water and energy. 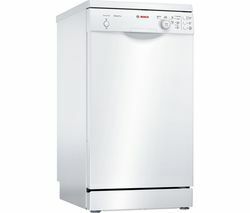 When it comes to dishwashers, there is no bigger brand than Bosch. There are three main ranges to choose from depending on your needs. The Classixx models are the smallest in the range, these have room for 120 plates, pots, pans and pieces of cutlery. The Classixx models also come as slimline and integrated versions. Every Bosch dishwasher is rated A, A+ or A++ for energy and have plenty of useful features including a delayed-start function that will allow you to set the dishwasher to come on automatically. Some machines in the range have a convenient quick-wash program so you won’t have to wait all day when you’re in a rush. When choosing your dishwasher it makes sense to give a bit of thought to what you will use it for, if you are prone to making a mess in the kitchen you might want to consider a model that features an extra-large spray head to make light work of your dirty dishes. 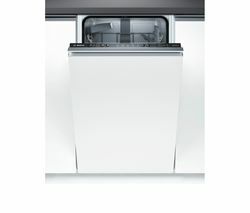 The BOSCH SPV40C40GB is a slim-line integrated dishwasher that will complement your fitted kitchen. Check out more great dishwashers from brands such as Hotpoint and Grundig.